This week we’ve looked Christianity’s potential in China to provide morality, work ethic, and possibly an opiate to keep people working through exploitation. The Chinese government has noticed these things and many within the party seem keen to enjoy the benefits of Christianity. So they’re doing what they know how to do best: Throw money at it. The government is approving, funding, or outright building churches across the country. Party leaders are more than happy to let you worship…as long as it’s at one of their churches. Lest any religious organization go off the grid and pull a Falun Gong or Taiping, no church is allowed to operate without approval and constant oversight. So as a matter of logistics, official churches tend to be few in number and large in size. Several months ago I went into one of these churches in Anhui. Sure enough it was magnificent. It was six stories high, capable of holding thousands of worshippers and the interior resembled a European cathedral. But I was less impressed once the service started. The sermon was boring, people went through the motions, sang a bit and left. And I’d guess about 90% of the churchgoers were over 60 years old. It’s the kind of place I’d go just to fulfill a religious obligation. 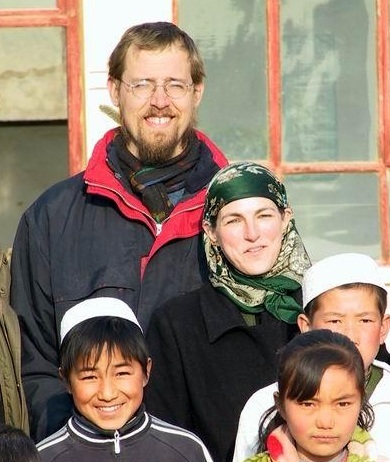 Her church was in fact a little studio apartment in Beijing’s Zhongguancun district – a stone’s throw from where several Shouwang Church Evangelicals were arrested last year. And like the Shouwang church, this one was technically illegal. About 25 people showed up, almost all in their 20’s or 30’s. They sat in rows before a pulpit where the preacher, Brother Xing, pounded on the podium and yelled throughout his sermon. He was a firebrand that would never get approval to preside over an official church. But for the young adults accustomed to hearing docile scripted speeches from school and government officials, he was an inspiration. They swayed back and forth as they sang hymns while some occasionally started tearing up. At the end several people stood up to give testimonies about how faith was helping them through their lives. As they all stuck around for socializing afterwards, it became obvious why most choose this over official churches – where spontaneity is barred and sermons must be pre-approved. The party sees the value in developing religion, but like it does with film, art, education, and just about everything else, it thinks money is a substitute for freedom. In its insistence on maintaining complete oversight and control, it neuters the institution and ensures the full benefits aren’t reaped. There are of course risks with religion’s spread other than threatening the party’s rule. With religious freedom, there’s always the potential for cults to emerge. But current circumstances hardly protect against that. In fact, by forcing these churches underground the government just gives cult leaders the perfect excuse to keep congregations in the shadows. Then there’s good old fashioned dogma. I once met some Chinese Christians who’d done Bible study with American missionaries. They spewed bile about the sin of homosexuality and the need to take evolution education out of schools. It yanked me right back to the worst of what I thought I’d left behind in Kansas. With the success of any religion comes the chance that its influence will lead to social and scientific regression. But the government has more pressing issues. An increasing eat-or-be-eaten mentality in an overall system of corruption undermines the country’s ability to sustain itself though development. The political risks of religious liberalization pale next to the potential. I’ve noticed (and the experts I’ve spoken with have agreed) that Chinese Christians seem mostly disinterested in politics with the exception of one issue: Religious freedom. They just want to worship how they want without being bothered. Then they’ll have peace of mind. Marx devoted a lot of ink to the 4th stage, where he said capitalist oppressors exploit the underclass and use religion as an “opiate” to keep them content with their repression. Eventually when stage 5 arrives, equality will make religion obsolete. In 1949, China was more-or-less at stage 3. Mao thought he could just make a “Great Leap” to stage 5 by enforcing the tenants of a socialist society with an authoritarian hand. This included wiping out religion. The next 30 years under this policy were unsuccessful to put it mildly. Eventually though, Deng Xiaoping came to power and acknowledged that stage 4 is kind of important. So along with a capitalist economy, he accepted religion with the expectation that it would gradually die out on its own through the natural progression of Marxism. Fast forward 33 years to now and China is living through the worst of the capitalist excesses Marx wrote about. Recent stories on Foxconn have illustrated that, in spite of some improvements in recent years, China’s workers still endure conditions deplorable by western standards. Last month, Elizabeth Economy also revealed statistics that show how the land grab epidemic and exploitation of farmers is getting worse. And last week, Bloomberg highlighted China’s mammoth wealth inequality and marriage of money and politics. Their report said that the 70 richest delegates in China’s National People’s Congress have a combined $89.8 billion. This compares to $7.5 billion for all 660 top officials in the U.S. government. 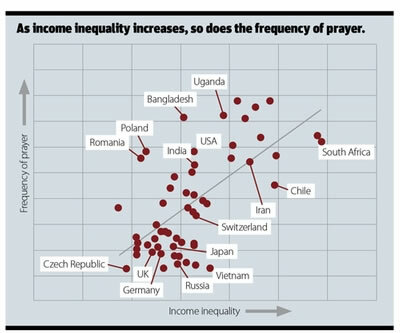 When faced with such problems, there’s one thing people around the world tend to turn to: Prayer. To see an extreme example of the power of faith during times of exploitation, we can look back to American and European slavery. By the time the American Civil War came, the slave population was almost entirely Christian. Masters encouraged this because it gave slaves hope for the next world. With the promise of heavenly reward for hard faithful work, inclinations to seek freedom in Earthly life were subdued. In one form or another, exploitation continued through the industrial revolution as the lower class created capital that mostly went to the upper class. But then the West eventually reached “development.” Some governments have even stepped in and made healthcare and education universally obtainable, which has helped push down wealth inequality. Several western countries are now moving toward what some might consider socialism through these policies. And a funny thing is happening: Religion is shrinking. Nowhere is this more apparent than in Scandinavia. Those countries have pushed down wealth inequality to the lowest levels in the world, while per-capita wealth and happiness are among the highest. These countries also now happen to be the least religious. Marxism is lacking in many areas, but it may not be as discredited as previously thought. Pitzer College sociology associate professor Phil Zuckerman has done research that compares religiosity and societal health. His findings show that countries with higher levels of organic atheism do indeed correlate with better indicators of a healthy society. I asked Zuckerman how this fits with Marx’s theory of religion and development. Whether it’s Weber’s work ethic, Marx’s opiate, or a little of both, data suggests religion plays a role in developing societies and allowing the accumulation of capital. But then affluence, education and equality largely make the supernatural aspect obsolete. So when talking about morality or social effects, secular countries like China – where atheism has been forced from above – are a world apart from secular countries like Sweden. Sweden may be secular now, but it did develop under a religious moral framework. Nobody can yet say whether the religious work ethic, moral framework or “opiate” are absolutely necessary for China to develop to the level of Western countries, or if Confucianism will be able to pick up the slack. But the developed club is so far overwhelmingly made up of countries that have gone through periods of majority religious populations. The Chinese government isn’t blind to this. Many in the still-very-authoritarian Communist Party see the potential for religion and want to guide its development…on their terms. But, as Zuckerman pointed out, China’s capitalism is still missing one key ingredient from Marx’s scheme: Democracy. Tomorrow, we’ll wrap up this series by looking at how that’s affecting the potential of religion in China.